Here at Mix & Match, one of my big goals is to help y'all feel confident that you're making good decisions when it comes to decorating your homes. I want this blog to be a source of easy-to-digest, actionable design tips, and be a resource for you as you dive into your next project! There are so many things to think about, but I'm here to help with posts like these that cover some of the most common decorating questions I get or design mistakes I see. They'll (hopefully!) answer some questions you have and enable you to move forward. Woohoo! Today, I want to dive into a topic that everybody needs to think about at some point when they're decorating, and that's how to choose the right side table and lamp combo. This is a particularly pertinent topic for living rooms and dining rooms. Picking these two small pieces is pretty important both function-wise and style-wise; after all, tables are kind of critical spots for drinks, books, and other items, and you need table lamps to light up a room and add ambiance. At first glance, you might think how hard can it be to pick the right combo? Just grab a table and plop a lamp on it, and you're set! But if you've ever done that and thought, huh, this doesn't really look right, that's because there are three things you need to consider to nail this little, but important, aspect of decorating a room. So let's talk about those! Height is an absolutely crucial part of this, and it's not just about the height of your individual table or lamp, it's about the heights of them relative to each other and the piece next to them. Whether that's a sofa, chair, or bed, in order for it to look good all together, you have to factor in all three of those heights. It's actually easiest to start with the height of the piece of furniture your table and lamp will sit next to, and then decide what the size of your lamp and table should be. A good rule of thumb is to choose a table height that's about the same height as the item next to it - whether it's the arm of your sofa or chair, or the top of your mattress (plus or minus a few inches). 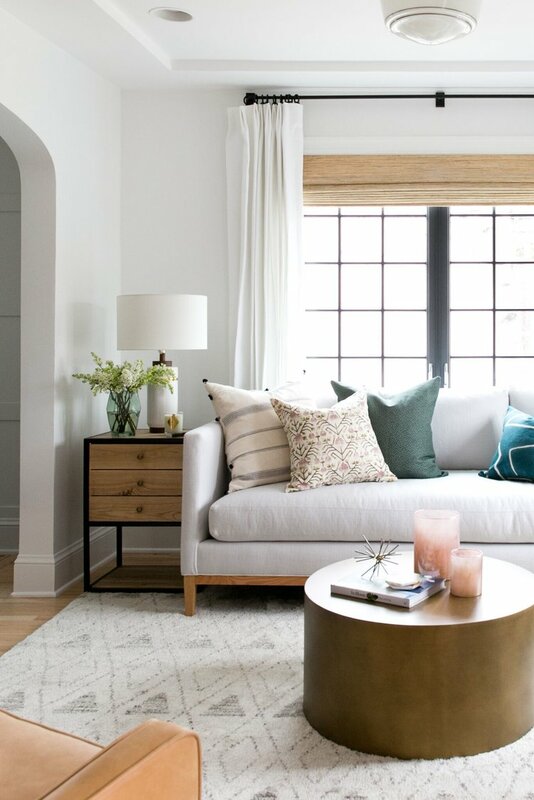 So if your sofa arm is 24" high, choose an accent table that's about that height - nobody wants to have to reach way down or way up to use the table! There are exceptions to this: for example, if your sofa arms are super high, it's ok for your table to be a good bit shorter, or if you choose a tall table, a shorter lamp may be fine. If you have a piece like that in your home, sometimes you just have to play around and see what looks right. Your table height will then dictate the height of your table lamp. In general, you'll want to choose one that's approximately the same height as, or slightly taller than, the table, which will keep them looking proportional to one another. You'll also want to be sure that bottom half of the shade is around eye level when you're sitting on your bed or sofa for the best lighting situation (no blinding bulbs in your eyes, please!). One of my pet peeves is seeing either a dinky-looking lamp on a large end table or the opposite where a huge lamp takes up the entire table top. This concept of scale takes into account the height and width of your lamp and table; in other words, the "visual weight" of your lamp relative to the table it's sitting on. If you have a chunky table, choose a heftier lamp, and if you have a petite or visually light table, choose visually lighter lamp. Another important rule of thumb here? Make sure your lamp shade is narrower than the table top. If you're shopping for these two pieces independently, always measure them (or take note of the measurements in the listing) to make sure they'll work well together. Don't just trust your eyeballs, especially when you're shopping online. You can't always tell how large or small they are - photos can lie! 3. Balance Style and Function. As with all decorating decisions in our homes, it's important to balance form and function. When it comes to choosing the right side table/lamp combo, striking that balance will help you make the best decision that works with your style and serves your needs well. The lamp and table style you go with is up to you of course, but be sure that they feel cohesive with the rest of your room. Also, think through if you want them to make a big statement or play a supporting role to the rest of the room's design. For example, a stand-out lamp can be awesome and eye-catching, but if your room already has other "stars," you might want to consider something simpler and more subtle. When it comes to the functional side of choosing these two pieces, think about what you need them to do in your space. Do you want your side table to have drawers for storing miscellaneous items or will a simple table work? Does your table lamp need to be a major light source for your room or is it more for reading and occasional additional lighting? All of these questions are important to answer before you fall in love with a piece that won't satisfy the functional needs of your space! 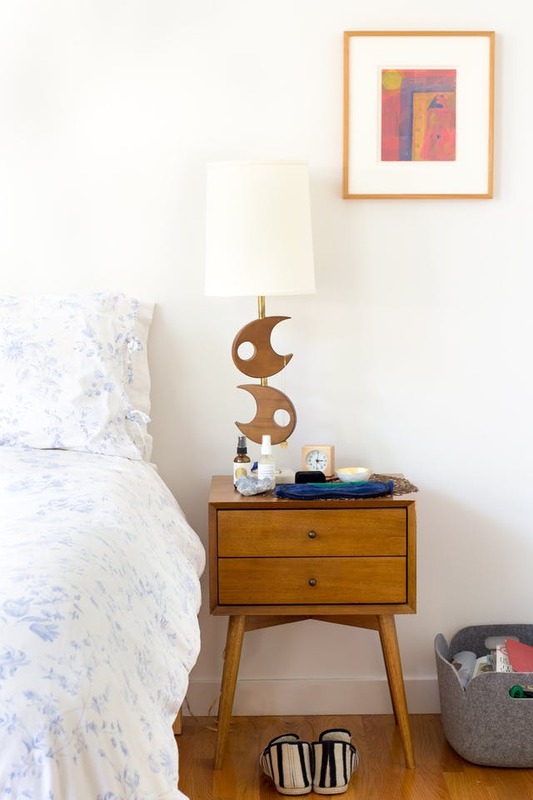 Let's look at some great side table and lamp combos! Now that you've had your primer in how to choose the right side table and lamp, I wanted to share some real life examples of combos that I think work particularly well. The possibilities are truly endless, but these six are a good starting point. They check the boxes on size, scale, and proportion, and I tried to choose combos that work well relative to typical furniture heights. If any of these speaks to you in particular, be sure to remember to take a look at the measurements to make sure they'll work in your space! Finally, I do want to add one thought about decorating in general - there's rarely ever a true right and wrong, but following some guidelines can certainly be helpful to pull it all together. Always strive to make your home a reflection of your personality, interests, and desires, and keep these design tips in mind to make it look its best! *Note that this post contains affiliate links, which means Mix & Match Design Company earns a small commission from your purchase at no cost to you.